There's a racecar heading down a straight. Of course, that might be a normal enough sight, except for one minor detail - looming large in the background is the Colosseum. The straight you see is on a street in Rome and the car you see is a Formula E car. Just in case it isn't obvious, the E here stands for electric. The FIA Formula E Championship, then, is a championship of all-electric racecars that will be held on street tracks around the world. 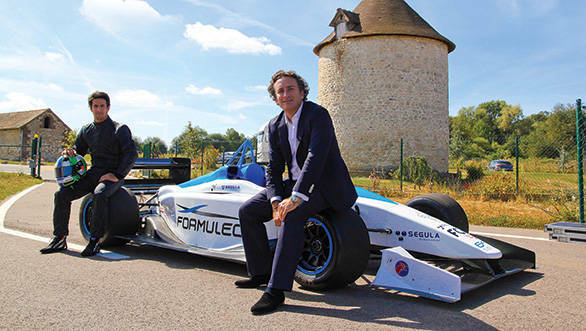 According to Alejandro Agag, CEO of Formula E, it's the way forward. 'The idea was to make a championship that was completely sustainable even with a full grid of cars,' Agag says. Which is why all the cars that feature in the Formula E championship are zero emission vehicles. But running a championship with zero emission cars doesn't guarantee that it will be sustainable in terms of energy resources. Agag is quick to declare though, that the championship will cut corners in other ways. 'Not only will the cars be zero emission, but the materials used, the transportation used for the series, all of it will be focussed on sustainability. The rest will be offset against carbon credit,' he says. According to Agag, since electric cars are the way forward in terms of intra-city mobility, electric racing ought to take place there as well. There's more to it though - with several other racing series finding it difficult to fill grandstands at races, Formula E instead aims to bring the races to the fans. 'It's easier for fans to make it to cities instead of traveling 20 or 30km away to a racetrack,' Agag declares. Besides the Formula E races will be held over the span of a single day, with practice in the morning, a shootout race to decide the qualifying positions, and the final race in the evening. Drivers will start the race in one car, before swapping cars during a pitstop, while the first car is put to charge, swapping back to the original car for the final dash to the chequered flag. Is India on the radar then? In more ways than one. To begin with, of the 10 races scheduled for the 2014 season, only nine cities have been announced so far. 'We definitely want a race in India,' Agag declares. 'We're considering New Delhi at the moment, because with its broad avenues it will suit our format of racing. Mumbai too, although there are the obvious infrastructural drawbacks and perhaps even Bangalore,' says Agag. And while India might not make it to the season calendar in 2014, a race for the 2015 season is almost certain. Formula E is also keen on having an Indian team participate in the series, as well as Indian drivers. 'We're talking to the two most famous Indian drivers at the moment,' he says.